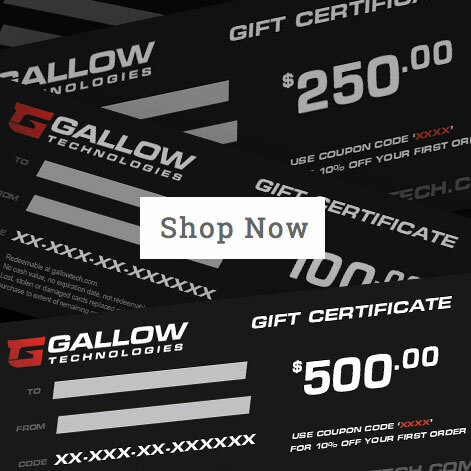 Gallow Technologies has set the standard for gun racking and display products. In these pages, you will find some of the best Weapon Storage products available. We offer storage solutions for nearly every application from a small closet for a couple guns to a full blown armory for 300 weapons. American-made, Solid Steel and Lifetime Warranty are just a few features that has quickly made Gallow the #1 choice in Gun Display and Storage! The backbone of the system is a 14-gauge steel, custom cut wall panel featuring a proprietary interlocking hole pattern. The wall panels are completely modular so they can be configured to fit any location and any size collection, from one gun to hundreds of weapons. It's time to toss out that old wooden gun rack! Don't see what you need, let us know? We have an awesome in-house fabrication shop that can build a just about anything. That’s right, we're also a custom shop for those who require something as unique as their collection. All of our products are based on the same unique interlocking hole pattern, giving you maximum design and storage options. If you need to store a lot of guns in a small area, or you are just looking for a beautiful way to display your weapons, our accessories give you tons of choices. Many of our customers want a way to not only store their weapons, but they want to show off a few of them as well. You won't find a better designed product on the market, it looks professional, and it's extremely functional. Our custom hangers allow the guns to hang vertical, horizontal or even on an angle. There are hangers and shelves for handguns, magazines, ammo or anything else you want to hang and display. We also have custom panel sizes that allow for vertical wall mount gun racks or a horizontal gun rack design. This way you can display your rifles in unique ways and it allows for fitting a rack in tight spaces. It's the perfect rifle rack solution for those who want flexibility in their design!